There’s a sense of adrenaline-spiked adventure inside Jon Wallace’s Cessna 172 Skyhawk, its single engine idling on the runway at Braden Airpark just north of College Hill in Forks Township. It’s a mostly blue-sky day as he adjusts the fuel mixture, checks the wind speed, and inspects the cockpit instrumentation and gauges—a lengthy, thorough sequence of pre-takeoff procedures for a smooth and safe flight. Engine primed, he gives an audible “clear the prop,” starts the engine, and taxis down the runway. Cleared for takeoff, the plane is up and away at 60 knots. Once aloft, Wallace checks for turbulence and climbs to 1,300 feet, circles above Metzgar Fields, LaFarm, and other landmarks oriented around Braden Airpark. After a 10-minute flight, he cuts the throttle and descends for a smooth landing. It felt, sounded, and looked real, perhaps even requiring a Dramamine, but Wallace never left the runway. The visceral experience was synthesized in his terra-firma flight simulator. But when he returned from Germany after earning his Ph.D., he reconnected with his former scoutmaster, Air Force Col. Richard Crandall, who encouraged him to pursue his dream. With determination, it took only a summer to learn how to fly. 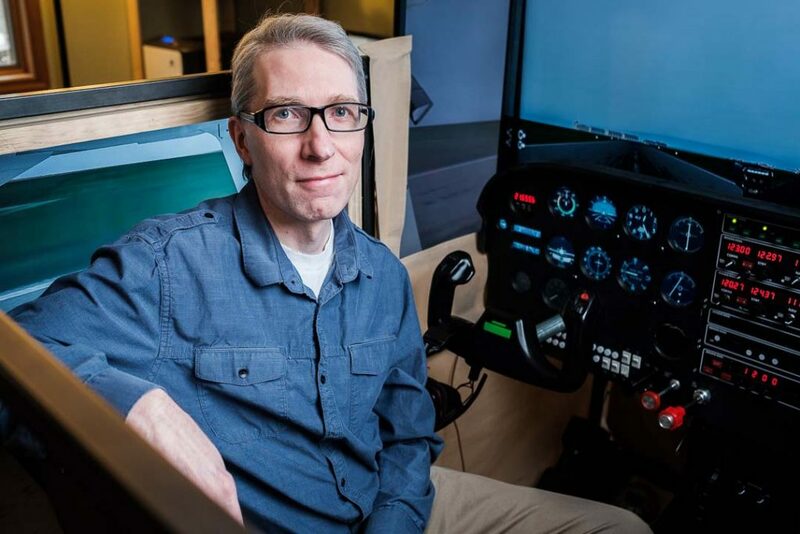 He taught a first-year seminar on aviation and noticed that the flight simulator was nothing more than desktop monitors with basic yoke controls and foot pedals. 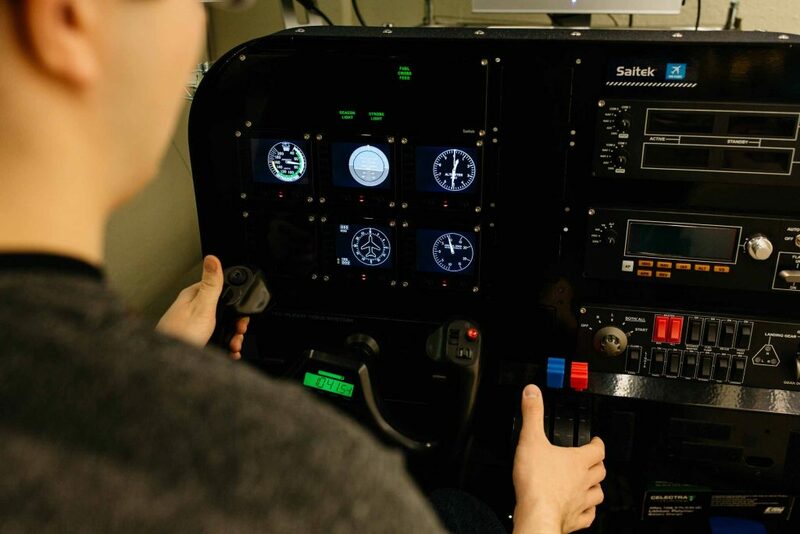 “The course motivated me to make something more realistic, to give students the feel of flying a plane without the danger,” says Wallace, who set out to build a simulator that would offer a 360-degree experience. 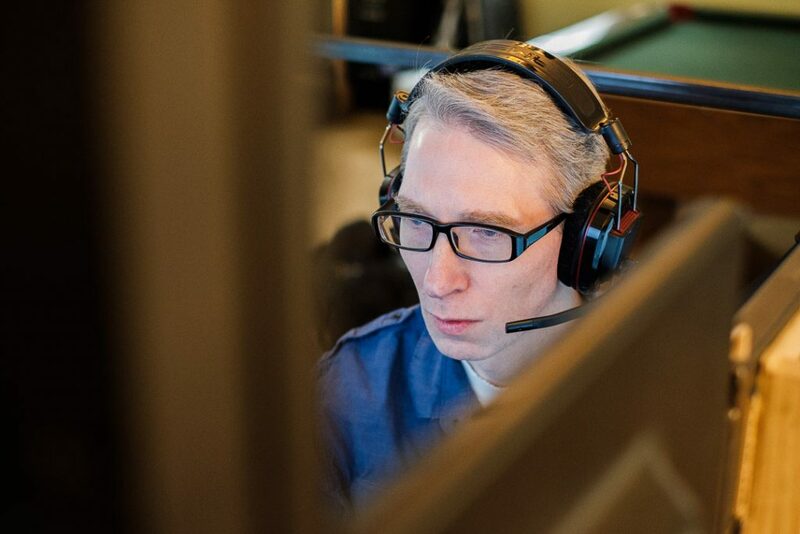 It took him four hours a day over about two months to complete a realistic simulator for a Cessna 172 Skyhawk, a popular trainer aircraft for beginner pilots. The simulator had its debut at an engineering open house, an event designed to introduce Lafayette to high school students considering colleges to attend. Word of it also spread among engineering students. Brian Gilfedder ’21, who took Wallace’s FYS, was so impressed that it inspired him to restart the aviation club. Gilfedder says the flight simulator experience was jaw-dropping. “There’s so much detail; it offers everything, with the exception of the floor rocking,” he says, recalling that a renewed interest in aviation soon took flight. At the beginning of the academic year, first-year students are encouraged to consider joining various clubs, but the aviation club had been grounded. There was no contact information on the website, and its former room in Acopian Engineering Center was dark and empty. 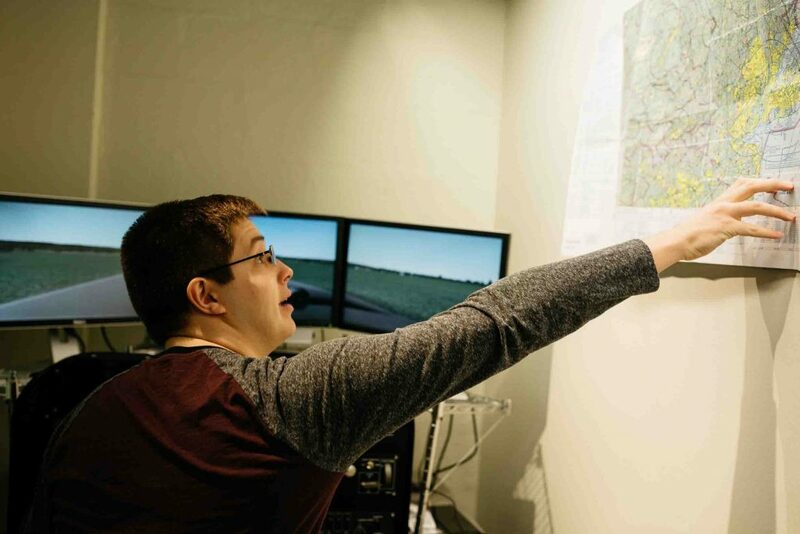 “Word got around about Prof. Wallace’s simulator,” says Gilfedder, who wants to pursue a civil engineering career in the aviation industry by working on the design of runways and airport terminals. “It’s a great way to reach out to non-pilots and provide a low-stress, low-risk environment to learn about flying. I followed leads, and sure enough found contact information for the club and tracked down its adviser, Professor Lawrence Malinconico,” he recalls. Within two months, the club was back up and running. It now has its own student-built simulator and 20 members. The timing for the restart of the club has coincided nicely with the Lehigh-Northampton Airport Authority’s interest in upgrading Braden Airpark, including the addition of a flight school. “While engineering is a part of the aviation industry, flying and careers in aviation, by their very nature, offer opportunities to individuals from all disciplines,” says Malinconico, a licensed pilot. “Pilots come from all backgrounds, and we often forget all of the supporting fields required to allow modern aviation to function, including, but not limited to, air traffic control, airport management and design, and aviation maintenance,” he adds. Wallace agrees, saying the interdisciplinary intersections with aviation are plentiful, especially with the growing reliance of electronics in aircraft. And with a flight simulator, skills and awareness are heightened in a safe and realistic environment. An alumnus EE, my AF pilot dream was similarly delayed by glasses. During my Army captains’ training, I became a licensed pilot and subsequently achieved my instrument rating and commercial license. My attempted Lehigh Valley International landing was aborted due to weather. Air Traffic Control diverted me to Hackettstown Airport, which then was a grass field surrounded by pastures. Unable to discern the runway in the fog, I was again diverted to Trenton Robbinsville. Nice to see the aviation club back on track! Keep up the good work! So proud and thrilled that the Aviation Club is back.